Lunch - avocado with salt, black pepper and habanero sauce.... nice ! Welcome back you blind old fart. Welkom terug Oom Toffee, ons het jou gemis!! I braai steak in the flames, not coals. It is difficult to get even heat, therefore even cooking with flames. If you can get it then kudos to you ! I always use flames. Chilli is it important to rest steak a few minutes before serving? Another good steak - "picanha". Sirloin with a difference. I think that is the one Chilli was referring to. It is common in Brazil and you get it in all Brazilian churrascarias - barbecue restaurants. A really tasty cut. Do they have churrascarias in SA yet? Enough to get me out of my hibernation. For a short while. Try coconut oil for flame grilling a steak - had some dramatic effects with it. Lowish combustion temperature. Canola oil is much higher. My donner, hy leef! Wat het van jou geword WT? "Hibernate" so bietjie. Mors te veel tyd hier, het eergister begin kyk of jul nog leef na Rassie se eerse twee toetse. Sal BAIE minder tyd hier moet deurbring - besigheid roep. Jy gaan nie weer loop oor kinderkak nie. Ek gooi hier n moerse klomp politiek aas uit , sonder n byt , om eers later uit te vind jy het gepack up en pull out! It's extremely important. Rest for about a third of the time (minimum) it took you to braai it. Busy with a braai project as well. 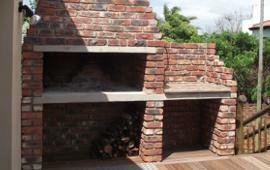 Massive braai (2 meter opening), with working tops left and right (1.2 meter each). Floor is paving at the moment, want to get a concrete floor with big, rough edge outside tiles. Getting a roof as well. First quote was R 180 000! Agree. Often use it at home now on the braai and on the spit. Fantastic stuff. Sirloin is a cut for'ard of the rump. Just as tasty. I do not know about the churrascarias, Sorc might be able to tell you if they have them in Jo'Burgh. .
Last edited by Wilson's Toffee on Wed Jun 13, 2018 2:23 pm, edited 1 time in total. Indeed. I miss all your tongue in cheek comments which drive someone, who likes to report pisters, completely nuts. Moet 'n slag gaan LAANNNG vakansie hou, sonder internet. Kort dit, werk al jare sonder behoorlike rus. Glad to see you chaps, too. Actually missed you, come to think of it ..
Fairymuff. An old doos like you is hardly likely to get fresh. Ok, to give an idea of where this braai area will go, here a photo of the property. It will go next to the pool at the back, and when looking at the photo, either on the right side or straight back extending out from around the middle of the pool. There would be a short paved walkway to the braai area. I'd say go for both if space allows it. Men stand by the braai and the women a few meters away around the voete-braai. The second option is the one that'll add value to your house, however it will hit your wallet early on too. I reckon you should add a pizza oven beside the braai, they're all the rage at present. add a pizza oven beside the braai, they're all the rage at present. That has given me an idea for our soon-to-be huisie. Believe it or not, the the current state of those two in the photos, the second one would be cheaper...if I don't do the paving on the ground. Plan is to have pebble rock on the ground with the concrete seating a little further away allowing space for a few beach type chairs for seating closer in. Good place to hide your biltong from the women/kids while you braai. But now you have me thinking sandy....both is what I'll probably do. The traditional braai in an area to the right of the pool and then at the back right of the yard under the trees a more traditional campfire fire pit with pebble rocks and nice seating around the fire. Yard is a good size so that area under the trees will be a good spot for that. Just make sure you design the circular seating properly. Nothing worse than a bench where the seat is too narrow (like the one in your pic) and the backrest is vertical. Get a 60 degree slope going to be more comfy. Last edited by Sandstorm on Wed Jun 13, 2018 3:50 pm, edited 1 time in total. Just make sure you design the circular seating properly. Nothing worse than a bench where the seat is too narrow (like the one in your pic) and the backrest is vertical. Get a 30 degree slope going to be more comfy. You can build a circular fire-pit about 3 feet high without even using mortar. Some tan coloured concrete blocks would be easy to stack. Picanha is the rump flap. Yes. Rule of thumb is to rest it for half the time that you cooked it for. Time to have a Vic Falls cabal braai at Chillie. Chilli is in Zululand, now. You will have to do a timeshare weekend at Nkandla. Exactly like the one I have now. I use it for a regular fire pit or when I use the spit. I believe you said the same thing last time when I posted a pic of my current setup in front of my braai now and fangle had to set you straight then as well. The rocks we're talking about here are very smooth and don't hurt at all, in fact...feels bloody good under foot.